The two original hardback volumes of A History of the Bible as Literature trace literary ideas of the Bible as they have come into and been developed in subsequent culture, from biblical times to the present day, providing a unique view of the Bible and its translation. 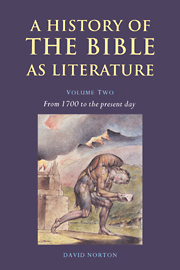 A revised and condensed paperback volume focuses on literary attitudes to the English Bible throughout its history. The project is, in the words of Sir Frank Kermode, a 'careful, deeply researched and readable' account of its large and important subject.